get "out", outfitted and away! Women's travel means fun, exploring and socializing with fellow adventurers. Enjoy an adventurous, active vacation for women only - outdoor adventure by day, and superb food and comfort at night. Perfect vacations for single women and solo travelers -- women's travel tours are easier & safer than going on your own, and so much more enjoyable! We are reaching out to every woman on the planet – every country in the world – to come and travel with us and make friends for life. This is no small feat, but we know that if enough women join Brave Women Travel, our dream can come true. We want you to tell all your friends, your colleagues, your moms, sisters, aunts, cousins…. every woman you know. Come and join Brave Women Travel! Features content relating to European travel and expat life intended to inspire and provide courage to people, especially women to travel more or even move abroad. Special focus is given to having unique and cool experiences not typically featured in guidebooks (checking out unusual museums, hunting down street art, doing extreme sports) and undertaking adventures as a solo female traveller (having dinner for one, hiking alone, going to the spa). Chick on the Go was created to enable the traveling woman, whether traveling for business or pleasure, to have an entire wardrobe at their fingertips. Chick on the Go is comprised of a beautifully decorative cosmetic sized case prepacked with FIVE MUST HAVE pieces of clothing and TWO accessories. These garments coordinate together to create an array of different combination's, which complement conservative business attire, elegant social events, casual dining or even lounge wear. The number of combination's one can create are limited only by their imagination. 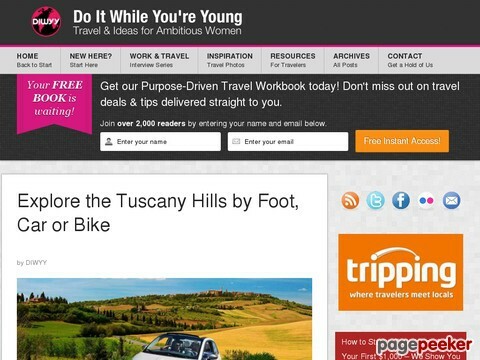 Chicks Be Trippin is a new, interactive travel and leisure site, designed to be a place for readers to share experiences and tips on Trippin. Equality in Tourism is an independent, non-profit women’s network dedicated to ensuring women have an equal voice in and share of the benefits from tourism globally. We provide gender specialist advice, capacity building and innovation through a network of experts. Engage us to facilitate gender equality in tourism.